Hanoi (VNS/VNA) - Bank stocks strengthened during August 18’s afternoon trade which rescued the VN-Index from another fall as investor sentiment remained fragile. The benchmark VN-Index on the HCM Stock Exchange edged up 0.18 percent to close August 18’s session at 768.97 points. It decreased 0.8 percent on the previous session. Banks led the market rebound with five of seven listed lenders on the southern market advancing. Eximbank (EIB) rose by the daily maximum rate of 7 percent, settling at 6.6 percent to 12,050 VND a share. BIDV (BID), the third largest listed bank by market value, increased 2.9 percent, while the two biggest lenders – Vietcombank (VCB) and Vietinbank (CTG) – picked up by less than 1 percent each. VPBank (VPB) which debuted on August 17 with 1.33 million shares dropped 4.6 percent at 37,200 VND a share and was no longer the most expensive bank share. Meanwhile, Sacombank (STB) edged down 0.8 percent. Many heavyweight shares in the VN30 basket (which tracks the top 30 shares by market value and liquidity on the HCM City’s exchange) also advanced and supported the market, including steelmakers Hoa Phat Group (HPG), Hoa Sen Group (HSG), food-beverage firms like Vinamilk (VNM) and Kido Group (KDC), and real estate developers like FLC Faros Construction (ROS), Novaland Investment Group (NVL) and Kinh Bac City Development (KBC). On the defensive side, energy and pharmaceutical shares slumped and weighed on the market, such as PV Gas (GAS), PetroVietnam Drilling and Wells Service (PVD) and DHG Pharmaceutical (DHG). 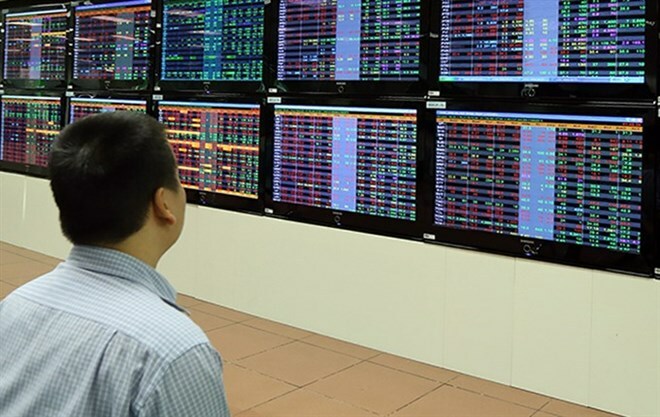 According to BIDV Securities Company, August 18’s recovery was driven mainly by VN30 large-cap stocks, especially in the banking, food-beverage and steel sectors. However, liquidity in these stocks remained modest while overall liquidity was weakening. “The VN-Index may return to 770 points and fluctuate around 770-775 points next Monday, but market risk remains on the back of unstable liquidity,” they wrote in a note. On the Hanoi Stock Exchange, the HNX-Index inched up 0.34 percent at 100.83 points.